Thank goodness the rhinoceros is launched. Thank goodness the tour is over. Thank goodness we don’t have to see any more ‘arty’ photos of the book by the beach, or in a boat, or framed weirdly by random sticks. Thank goodness we don’t have to humour any more of Meg’s crazed attempts to draw rhinoceroses in tutus/jumpers/both at once. Maybe she’ll go back to her cave now and stop shouting LOOK! MY BOOK! This entry was posted in Drawn Onward, Events and tagged bookshops, illustration, launches, publicity, shiny new book on October 2, 2017 by Meg McKinlay. It’s been a busy few days. It began on Friday morning when I sat bolt upright at 3am and realised the year was drawing to a close and my annual carbon footprint was altogether too small. Happily, this was easily remedied. I rolled out of bed and drove immediately to Perth airport. I flew across the country and all the way up to Brisbane. Then I drove to a hotel, stayed overnight, and at the crack of dawn, flew home to Perth again. And just like that, I was back on track. A Single Stone was announced as the winner of the Griffith University Children’s Book Award at the Queensland Literary Awards! 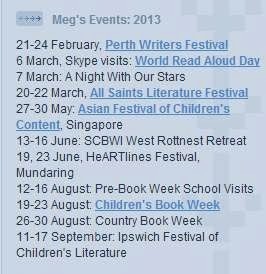 This entry was posted in A Single Stone, Awards, Bella and the Wandering House, Chapter Books, Events, Junior Fiction, Queensland Literary Awards and tagged awards, busybusybusy, launches, shiny new book on October 13, 2015 by Meg McKinlay. We gathered, we laughed, we launched! I’m delighted (so very delighted, Amanda Betts!) to announce that the official launch of A Single Stone went off swimmingly on Thursday, 7 May. Against the backdrop of a stunning Fremantle sunset at Kidogo Arthouse on Bathers Beach, a lovely host of friends, colleagues, and other possibly-soon-to-be-one-of-those-things folk ate, drank and were generally merry as Amanda (AJ) Betts launched the book in characteristically hilarious style. This entry was posted in A Single Stone, Events, Junior Fiction and tagged launches, shiny new book on May 10, 2015 by Meg McKinlay. It won’t be quite that simple, but I think you get the idea. This entry was posted in Events and tagged busybusybusy on February 11, 2014 by Meg McKinlay. Yes, I know he isn’t exactly Mr Curly. That would be like saying I’m Ruby, or Cassie, or possibly even Max. But last weekend at the Perth Writers Festival, I met the maker of Mr Curly and of many things duckish and otherly delightful – Michael Leunig. I’ve made no secret of the fact that the original inspiration for Duck for a Day came from an interview Leunig did with Andrew Denton, but beyond that, I’ve been a long-time fan of Leunig’s work, which my father shared with me from a very early age. The corkboard above this very desk is dotted with tattered Leunig cartoons, snipped from newspapers here and there over the years. This entry was posted in Definitely No Ducks, Duck for a Day, Events, Ten Tiny Things and tagged all things duckish, inspiration, Leunig on March 4, 2013 by Meg McKinlay. Here beginneth the second in what appears to be a biennial series. It’s my own personal poetry week, very much like the one I held back in February 2010. It’s being held for exactly the same reason: I’ve been invited to guest at Perth Poetry Club and really need some new material to read. But more than that, I really need to work on the hundreds of fragments that have been accumulating in notebooks and files for years, the many beginnings of poems that sit quietly, waiting for my attention. In my quest to have some of them ready for this Saturday, when I’ll be reading, I’ve identified a handful that look promising. I’m going to throw the (current) opening lines down here in order to hold myself accountable in a semi-public way. And also because I’m narcissistic like that. I did this last time, and it worked. And I’m all for whatever works, narcissism and all. This entry was posted in Events, Poetry on March 5, 2012 by Meg McKinlay.